Now, PostGIS is able to store 3D geometries as TIN and POLYHEDRALSURFACE and to import 3D data with the collada2pgsql command. I decided to add functionalities in order to manipulate these new geometries. 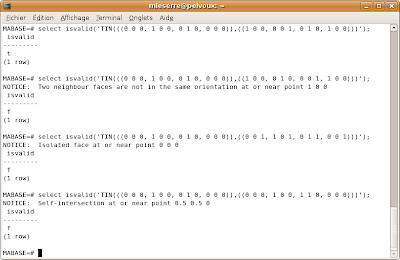 First, I implemented the isvalid operator in GEOS for TIN and POLYHEDRALSURFACE. GEOS (Geometry Engine Open Source) is a geometric library for PostGIS and the isvalid operator is based on the mathematical definition of geometries. It's important to notice that a TIN or a POLYHEDRALSURFACE stored in PostGIS can represent a 3D volume but not be a valid geometry if we refer to its mathematical definition.